View of a tent city with wooden hotel building (Headquarters Hotel) in the background. A few men stand around the fronts of the tents to the left. Tent cities traveled with the railroad because they were easy to assemble and could be moved quickly as the railroad developed. They existed because of the construction of the railroad and the building of the city of Fargo. The men that stayed in these cities were accustomed to hard living conditions, as tents did not keep heat very well in the cold area of Fargo. 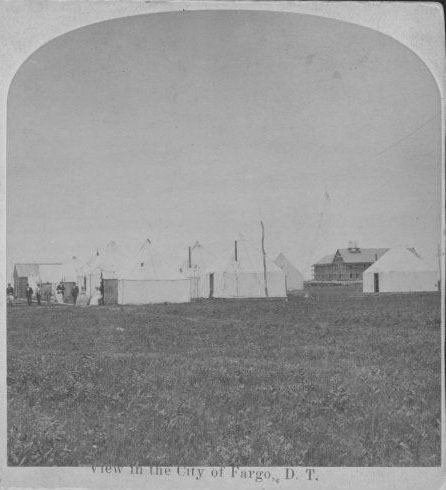 The men that resided in these tents were originally located in “Fargo on the Prairie” but were banned and moved to “Fargo in the Timber.” They were construction workers and survey crews who were banned from residing in the limits of “Fargo on the Prairie” for their recreational activity which included: liquor, prostitutes, and more. The tents that the men lived in were mostly made of canvas. This canvas was either packed solely for the tent or was thrown from a covered wagon and over tree boughs to create a temporary living structure. The tents were handy for construction workers because they were able to move at a moment’s notice, especially with the construction of the railroad. Danbom, David B. and Claire Strom. Images of America Fargo North Dakota 1870-1900 , 2002, p 11.